From SW Alberta/ NW Montana west to Vancouver Island and south to Oregon and Idaho. In Washington State, this species grows on both sides of the Cascades. Note: there are two sub species of C. hispida. C. hispida prefers sunny locations such as meadows, forest openings and edges, and grassy slopes. Perennial. Like other members of the genus Castilleja, this plant is hemi-parasistic. Though it may not be necessary, it will likely grow better with a host plant such as Roemer’s fescue. Seeds or cuttings. Do not try to transplant Castilleja species. There is conflicting information concerning the propagation of C. hispida. While some claim that it is extremely difficult, others have had good success. It has been observed that, though the seeds may be easily germinated, the seedlings often do not survive. This may be explained by summer drought, herbivory, or lack of a host plant. 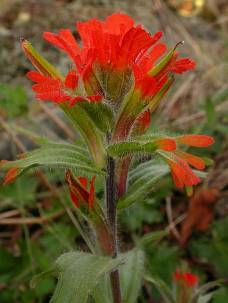 Beth Lawrence explains in detail how to propagate another Castilleja species, C. levisecta, in her thesis entitled, "Studies to Facilitate Reintroduction of Golden Paintbrush (Castilleja levisecta) to the WillametteValley, Oregon." It is quite likely (though not certain) that these methods would be appropriate for C. hispida. The following guidelines for seed germination and propagation from seed are taken from her work. Germination requirements may vary depending on the source of the seed. In general, seeds must be stratified for 6-8 weeks. Set seeds on a moist paper towel or germination paper in a dark place at 5° C for 6-8 weeks. Follow this by a post-chill incubation: set seeds in a warm, well-lit place for two weeks (checking for germination during this period). Keep moist. Seed life, as with viability, may vary depending on population source. It is best to use seeds within 1-2 years. Store at a low-temperature (5° C) in a dry, dark place. Vegetative cutting: David Schmidt conducted research on the propagation of this species from vegetative cuttings. He had the best results when cuttings were made early in the season (March) and applied with root hormone before setting in soil. This may be one good option for propagation, but the timing of the cutting (firmness of the stalk) is tricky and vegetative propagation alone does not offer the genetic variability that propagating from seed does. Plant in well-drained soil. Some fertilization every two weeks may help increase the success of the seedlings. Plant seedlings with a host plant in an open area. Make sure that the host plant does not out-compete the paintbrush. Watering during dry months may also increase survival rates. Lawrence, Beth. 2005. 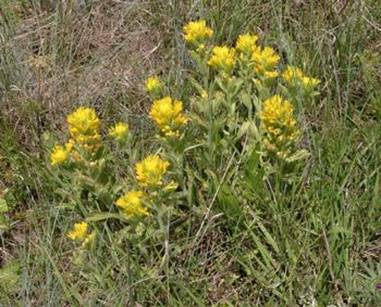 Master's Thesis: Studies to Facilitate Reintroduction of Golden Paintbrush (Castilleja levisecta) to the WillametteValley, Oregon. Department of Biology and Plant Pathology. Oregon State University. Corvalis, OR. PLANTS database: http://plants.usda.gov/. June 1, 2006. Schmidt, David. 1998. Master's Thesis: Restoration of a Prairie Ecosystem at the Yellow Island Preserve and the Propagation of Castilleja hispida by Vegetative Cuttings. College of Forest Resources. University of Washington. Seattle, WA. Data compiled by Samantha Martin Sprenger June, 2006.